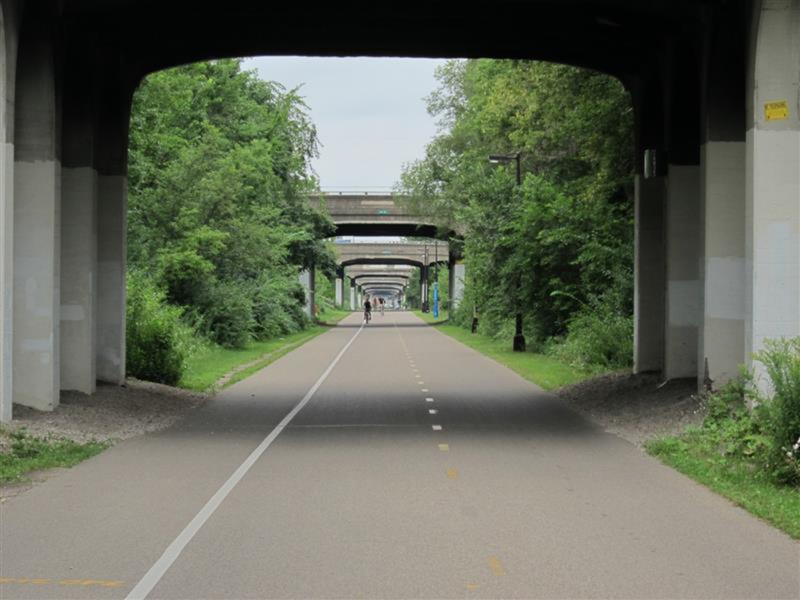 Named “the best urban bike trail in the USA,” by USA Today, the 5.5 mile-long Midtown Greenway gives runners and cyclists a great, convenient option for a run or ride within the downtown city limits. Within the last few years, Minneapolitans have gained recognition from the national biking community as being avid cyclists. 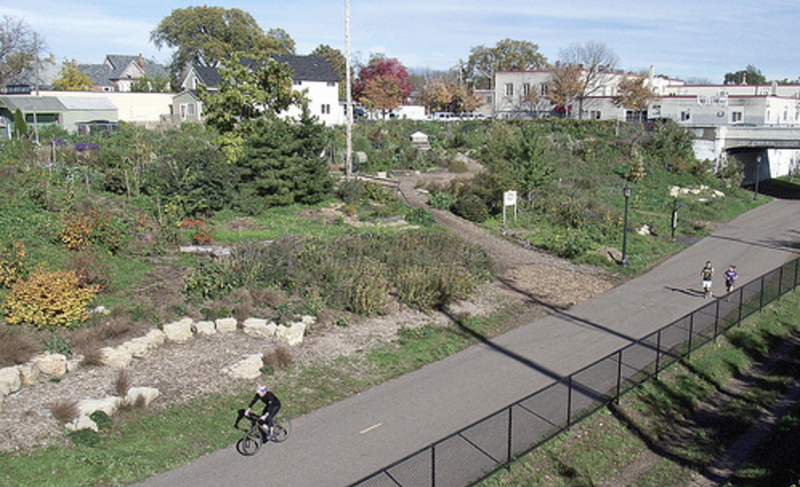 In 2010, Bicycling Magazine incited outrage by naming Minneapolis USA’s most bike-friendly city. Minneapolis may not have mountain and ocean-view trails like its brothers and sisters to the west, but the city makes up for it with its exceptional bicycling infrastructure and urban bicycle highway system. There are many things Minneapolis has done to improve their bicycling infrastructure. They provide public bike racks, 92-miles of segregated bike boulevards, and a diverse bicycling culture. Most importantly, Minneapolis has 85-miles of off-street designated bikeways and the Midtown Greenway makes up 5.5 miles of that. Formerly an abandoned railroad corridor, it now contains a world-class bike path that was named by USA Today “the best urban bike trail in the USA.” Thanks to the Midtown Greenway Coalition this trail offers great, convenient running and cycling options for the locals who want to get some exercise. The Midtown Greenway has minimal road intersections and offers flat, paved pedestrian pathways. Running parallel to Lake Street, the trail bisects the southern part of Minneapolis. Mostly surrounded by concrete walls and bordered by recently planted trees, the trail does not feature the most scenic of views, but if all you want is a flat, straight trail for pumped up bicycle riding, then this trail is a great option. Meanwhile, if you do want something more scenic, there are 28 trail exits that will take you to more fun, interesting places. Starting from Chowen Avenue, it is only a mile to the Chain of Lakes intersection. On a beautiful day, it is hard to resist taking a left turn and going bicycling around Lake of the Isles (2.75 mi) or Lake Calhoun (3.15 mi). The refreshing lake smells and lake activity make anyone’s day better. If you want to find a hip café, the Humboldt Ave exit will take you directly to Minneapolis’ vibrant Uptown neighborhood. If you run into any bike trouble, the Free Wheel Midtown Greenway Bike Center is just 2 miles down from Chowen. This shop is a common stopping point for the casual commuter and offers bike parts, repair services, cold water, and coffee. Also, this neck of the woods is home to the Midtown Global Exchange Building. A multicultural center, this building hosts a wide variety of delicious and reasonably priced food from all over the world. After crossing the Midtown Greenway Pedestrian Bridge —also known as the Sabo Bridge— it is a quick ride to the Mississippi River. The greenway technically ends at the river, but the bicycle paths do not. Taking a left will lead you to the Downtown Minneapolis Riverfront and taking a right will lead you to Minnehaha Falls. Either way, the path leads you to miles upon miles of well-paved, pedestrian-only trails. Minneapolis has the second highest number of bicycle commuters in the country who take a whopping 1.5 million trips each year on the Midtown Greenway alone. The Greenway is even plowed during the winter! No wonder locals love to run, bike, or take a pleasant stroll with the family on this exceptional trail. The Midtown Greenway is open 24/7. During the day, this trail is full of cyclists, but during the evening, the trail is much more quiet. Though there are nightly bike patrols, be cautious while cycling at night because there is one sketchy neighborhood the Midtown Greenway passes through. Generally, locals cycle on the city streets after twilight. It starts west of the city at Chowen Avenue and ends at the Mississippi River. There is parking available in the neighborhoods bordering the trail.